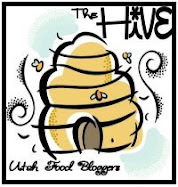 There is bakery in Salt Lake City that I used to go to several mornings a week when I was still working downtown. Among all the other delightful pastries they had there were big scones, tender, light, fluffy and filled with chunks of chocolate. I loved them dearly. I would get a big hot chocolate, which I think was always a bit comical to whoever was working the counter when they asked if I wanted it made with skim milk and I said yes, then when they asked if I wanted whipped cream that got a yes too. I just prefer skim milk for the most part, but I rarely turn down whipped cream. The skim choice wasn't a diet thing, just a preference thing. I've gotten many funny looks for it, but oh well. Back to those scones. Until I started going to some of the bakeries a few years ago, scones were to me what I guess is considered fry bread to others. We still call those scones too, but I had never had these sweet, biscuit-like scones. 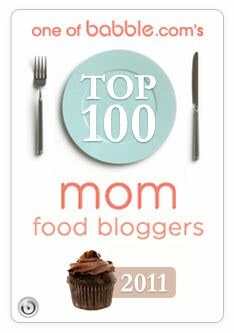 I was hooked and my favorite was, no surprise here, the Chocolate Chunk Scones. Now that I work from home and don't venture to many bakeries anymore, it was time to find a recipe to make my chocolate scones myself. Imagine my delight when flipping through my copy of Carole Walter's book, Great Coffee Cakes, Sticky Buns, Muffins & More (which, by the way, pretty much about categorizes 9/10 of all my cravings) to find a variation for sconese with chocolate chips in them. It didn't take me too long to make them. The recipe makes 12 fairly good sized scones but is difficult to cut in half, so make sure you stash a few in the freezer in an airtight wrap to enjoy later. At room temperature, kept airtight, they keep for about 3 days. These scones were better than a dead ringer for the bakery variety - they were better. Good chocolate and a nice sprinkling of crunchy sugar on top really make this a knock out recipe to have in your arsenal. Position a rack in the middle of the oven and preheat the oven to 375 degrees F. Have ready a large, ungreased baking sheet. For ease of cleanup, I lined mine with a piece of parchment. Combine the flours, sugar, baking powder and salt in the bowl of an electric mixer with the paddle attachment. Add the butter and mix for 2 to 2 1/2 minutes, or until the mixture forms pea-size bits. Gently add and mix the chocolate chunks into the flour/butter mixture, just to distribute them. Whisk together the cream, egg, and yolk. Remove the paddle attachment and replace with the dough hook. With the machine off, add the cream/egg mixture to the flour mixture, then blen on low speed just until the dough starts to form a ball of big clumps - don't overmix. Sprinkle a clean work surface with about 2 tablespoons of flour to start and turn the dough out onto the work surface, scraping out the bowl with a bowl scraper or rubber spatula. Lightly flour your hands and knead the dough five or six time til it comes together nicely then press it into a square about 8 inches big. Move the dough aside and clean the work surface, then flour it again with about 2 tablespoons more flour. Using a well floured rolling pin, replace the dough in the center of your work surface and roll it into a 9x12-inch rectangle, with the 9 inch side parallel to the edge of the counter. Fold the dough like a business letter, folding one-third down from the top, then the bottom third up over the top, pressing the edges gently to align them the best you can. You should end up with three layers of dough. Press the top gently with your hands, then roll into a 17x4 inch strip. Using a sharp knife or bench cutter, cut the rectangle into 12 pieces. When placing on the baking sheet, invert each scone and space them 2 inches apart. Brush the tops with the egg wash and sprinkle with the sugar. Bake the scones for 15 to 18 minutes, or until slightly firm to the touch. Remove them from the oven and cool them on the sheet for about 5 minutes before serving them warm. I love making scones and am always looking for new varieties. These sound delicious. I do the skim milk/whipping cream thing too at Starbucks! I'm glad I'm not the only one...and they chuckle at me in Ottawa too!! The scones look delicious! I'm with you on the skim- whole milk leaves such a thick icky taste in my mouth! 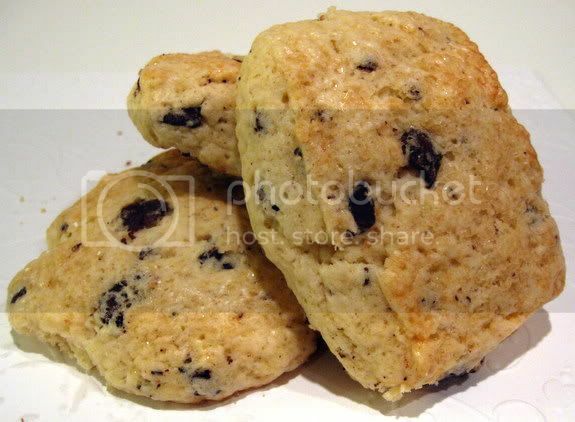 These scones are so scrumptious looking! How in the world do you stay trim?! Holly, Duh....they have chocolate. Of course they are super delish. Right? he he Seriously, thanks for that recipe and they sound so good. Breakfast is my favorite meal. Dessert is of course my fav course. Anyway, I haven't compared recipes but there is a book called the Pastry Queen by Rebecca Rather, she is down in Fredericksburg Texas. 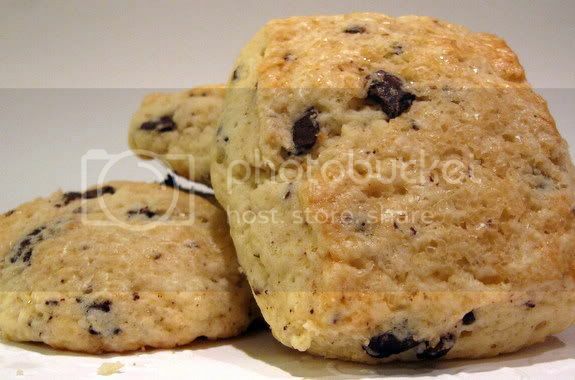 Chocolate chip scones are among the recipes and they are so good. Although these are a must try for sure. Just in case you collect books. Thanks for sharing. wow, those seem to glisten! What a great looking scone! I'm glad you found a better scone than the bakery!! Yum, your scones look wonderful! Holly - you are my kind of girl. Scones. Nothing better. And chocolate chips. Fantastic. Try them sometime with white chocolate chips. I have got to make these! I drink skim milk, but I still eat my sweet treats!